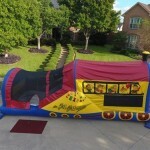 Jump City’s Train Slide Combo Inflatable Bounce House, Rock Wall and Slide! It’s a great item to have for cooperative players! It is ready for your children’s Party, or event. Rent one for your party today! Call now for your Dallas, Plano, Frisco, and all areas in between – we deliver on time every time!